In part 1 and part 2 of these mini-series, I went over the basics of installation of CakePHP 3, as well as setting up the initial database and table for our application. Now that the data modeling part is done :), it’s time consider the actual application. So what am I building? 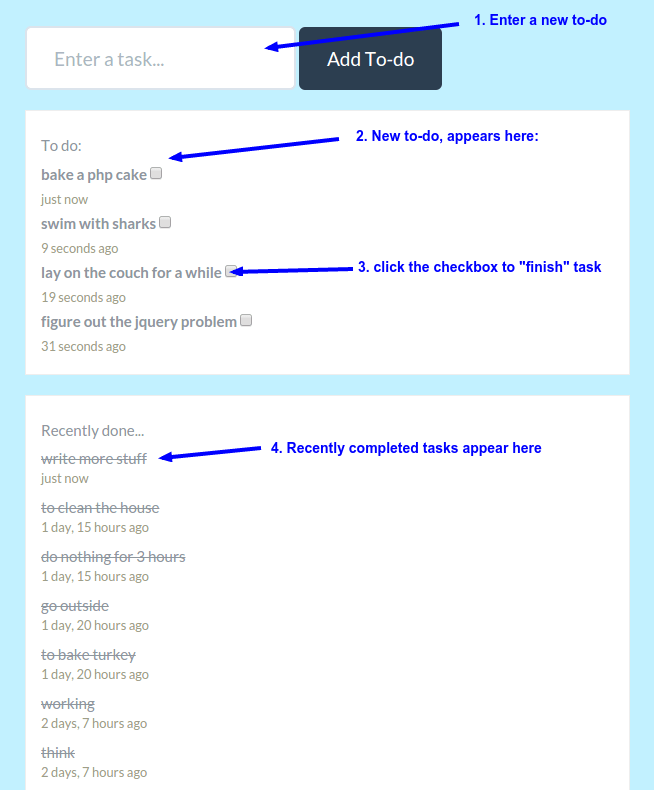 It is indeed a to-do app, a very basic checklist of things “to do” with the ability to mark them as “done” as well the list of some recently added and completed ones. There’s about a million of such apps out there, so my goal was to keep it simple and to show off a couple of things as far as new features of CakePHP 3 are concerned. As I kind of hinted in the previous post, the app is only going to work off of a single table, and all-in-all it will be just a one-page app. Once I download the bootstrap.min.css. file and place it in the webroot/css directory, it’s time to go ahead and modify the default layout file. This layout is the default “template” that our entire site will use. (Yes, the entire one page). Here we can load all the necessary CSS and JS that will be used throughout our application. As you see we’ve added jQuery, jQuery UI and Bootstrap CSS. Additionally there will be a little CSS file just for our app (called app.css). You can see it loaded at the top of the page. This is where you can add and override some default styling. It’s a cleaner way to make your changes, rather than messing around in the bootstrap.css file directly. Most events will be captured and processed by jQuery, so the field names aren’t as important. Also error handling is done a little differently, so again no real need to rely on the input() method. With all that said, the basic set up for the front-end is actually done. In the next post I’ll talk about adding some logic to both the front-end and connecting everything to our back-end (via the Controller and the Model layer). Also, I hope this makes things a bit more clear as to how everything is going to work, once I build out the rest of the application. ← CakePHP 3 – DebugKit, where are you?